With trends like virtualization and BYOD making networks more complex, the need for accurate and dynamic IP address management (IPAM) is growing. The ever-increasing size of today’s networks, keeping track of multiple types of data pertaining to the devices connected across the network becomes increasingly difficult. IPAM today has to go beyond allocation and tracking to centrally maintaining a real-time view of additions, moves, and changes. 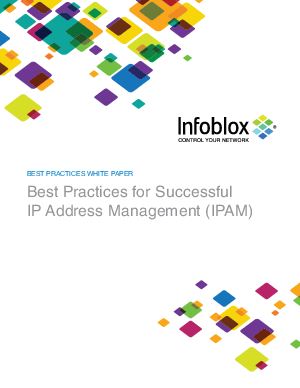 This white paper explains best practices for creating a central repository that combines IP addresses with pertinent information such as host names, device types, and locations tying this information together with a single, clear, easy-to-manage interface. Request your copy of this white paper and learn how Infoblox can deliver an IPAM solution that helps you centralize information to create highly efficient teams.